I teased this the other day and really feel bad that I didn't respond to the comments. I am horrible with secrets and wanted to share this because it is another one of those things that I can't believe I created. There are actually two "banners" that are mirror images of each other. I am calling them banners because there is only a top--no batting or back. The borders are a mess. I didn't do them the same and considered them temporary. One has mitered corners that are only pinned. women's conference at our church. Somehow, I ended up on the decorating committee. I help with some of the other decorations, but when asked about making a lion, I did a quick Google search and found a lion and tree in silhouette. I showed it to my friends and fellow committee members Kelly and Kathy and they said go for it. In fact, Kathy created a version of the tree on card stock for me. I had some ideas in my head and on a Friday, when to Joann's for some fabric. Once I had the fabric, I sat at home and stared at it wondering what I had gotten myself into. Figuring I needed to start somewhere, I cut off a sheet of pattern paper and marked the initial dimensions and using the rule of thirds, created a grid to align everything. Kathy's tree was very small on this and I realized I might have to draw the tree. So, I decide to focus on the size of the sun and the lion. 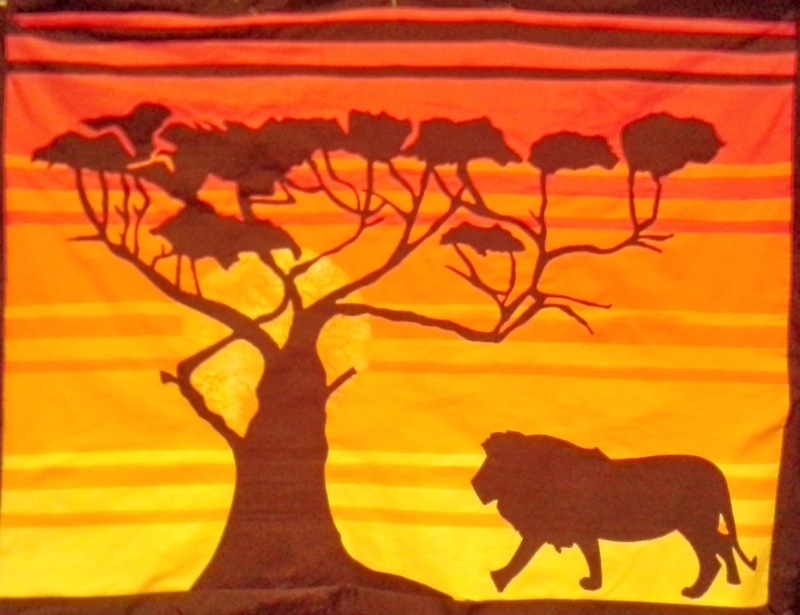 I took a picture of a lion that I had and using Adobe Illustrator created the silhouette, sizing it to what I thought would be the appropriate dimensions. Then I printed it on 4 tiled sheets of paper, taped them and cut it out. The lion looked like it would be the right size. I now could not do anything else until the tree was draw. I made my pitiful attempt. In an attempt to save face, there is no record of that tree. Mr. Toad became my super hero again and drew the tree. His dad even stopped by to give advice on size and proportions. Grandpa Toad is a great carver and painter (I keep trying to get him to open an Etsy shop, but he won't). Here is Mr. Toad's sketch of the tree on my "scratch" paper. In the bottom left corner is a corner of Kathy's tree. Kathy free handed the tree without looking at anything. She is one of the most creative people I know. She breathes creativity. 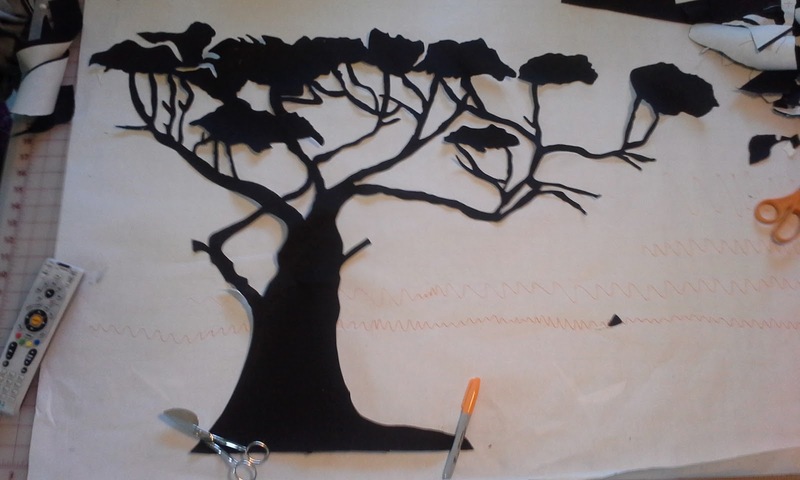 Once the tree was cut out, I took some Heat and Bond and traced the tree. I had to tile the sheets to be big enough to include the trunk. I taped the Heat and Bond so that it would not shift while I was tracing. It took almost 45 minutes to trace the tree. After tracing, I took the black fabric and ironed the Heat and Bond. 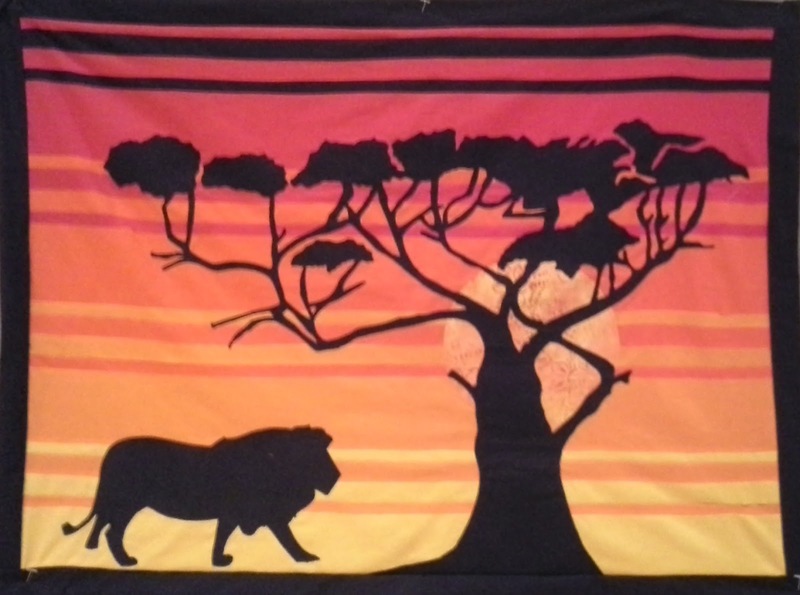 I also ironed the traced lion onto the black fabric. I then sat down to watch some recorded tv while cutting out the tree. This took a little longer than tracing, but I finished. Since I was doing two, I reversed the lion and traced it. The tree was drawn using pencil. I thought about flipping the paper over and tracing it, but it wasn't dark enough. I knew a fine point Sharpy would show, so I started outlining it. Then I had a wonderful idea! 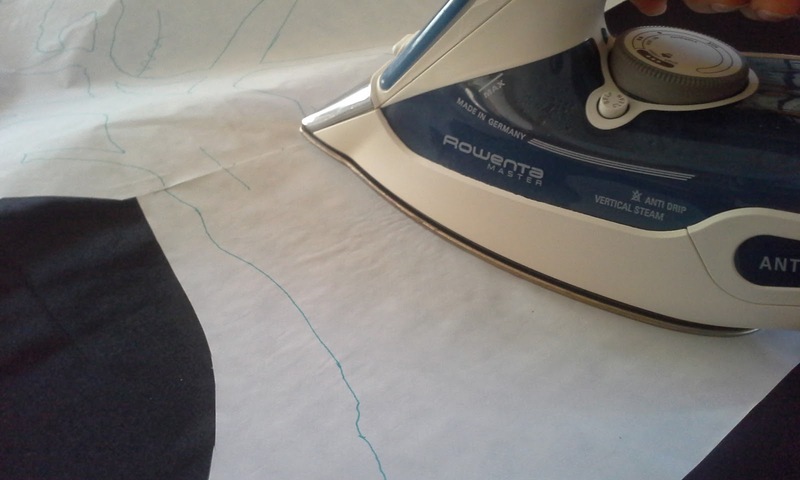 Why not turn over the Heat and Bond and trace it to the glue side, then iron and cut it out! So I did just that. I ironed it and because I used a black Sharpee this time, it disappeared. I sat down with a glass of water and gave my dilemma some thought. 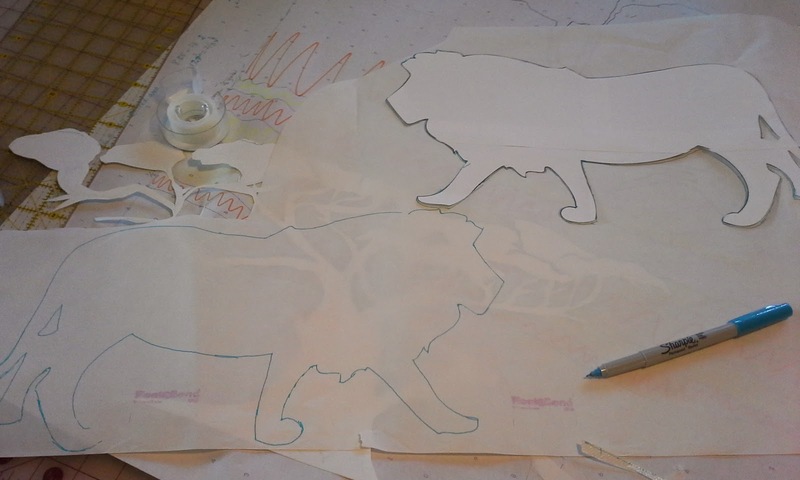 I will trace it using wax tracing paper. No. 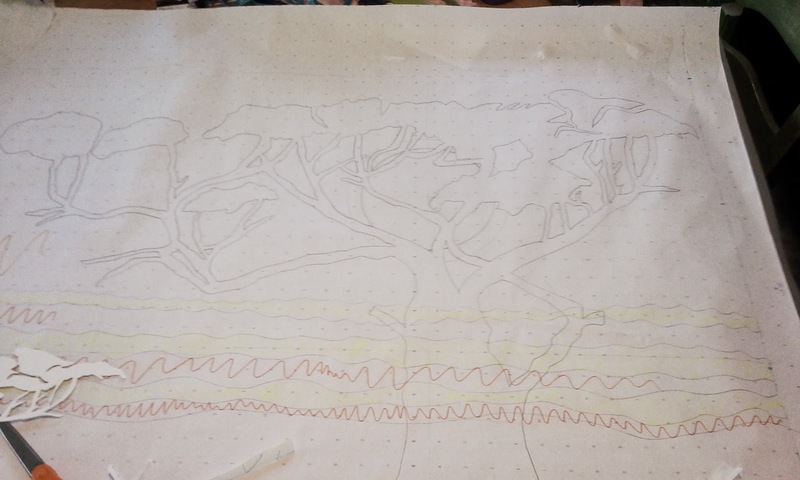 How about the previously cut tree laid on the paper and traced. So, with some effort and untangling, I used some painter tape and spent over an hour tracing. I was then able to trace it out. All of this happened on Saturday and Sunday. When Monday came, I could not get up. I was not feeling well and stayed on the couch napping on and off all day. I was panicking because I needed to be done by Thursday. Tuesday, I started cutting the fabric strips for the background/sunset. I had calculated and calculated and finally came up with what I wanted--Until I realized that Mr. Toad had made the tree a little taller than I had wanted. He thought my "no higher than this" line was the "the tree tops should start here" line. I needed to do some adjusting. fabric and cut out. It might just work! I cut both backgrounds at the same time. I wanted to make sure they were the same because they were to be the background on stage. I was able to sew the first background and iron the sun on before noon. It was about this time that I realized that I was going to have to stitch the appliques on. I had bought the same Heat and Bond that I had for another project and it is the sewable, which means "must sew or it will fall off." If you don't want to sew it, use the RED. I'm hoping that by putting it in all caps that I might remember. So, I stitched down the sun and ironed on the tree. The fun part of the tree was that all of those skinny limbs and the pretty tops that give the lacy appearance became a tangled mess. I also needed to align this where I could iron it and my ironing board was too small for the whole tree. I had to do it in pieces and almost 13 year old Middle Son kept pointing out that it wasn't level. I don't know if that helped or just frustrated me. This is a little wrinkly hanging on one of the walls. the other that was on stage? Once everything was ironed on and I let it cool, I started stitching from the bottom of the trunk. I used the blanket/applique/e stitch--this was not falling off. I followed all off the twists and turns around until I got to the other side of the trunk. Fifty-five minutes and I still needed to do all of the insides. I kept going and with another hour, I was done with the tree. I pinned the lion on and sent pictures to my friends who were now cheering me on. The next morning, Wednesday, I started stitching the background. It is nice to do long straight lines when you can put the foot pedal all the way down. It is hard to believe how fast that needle can go. Its a little scary too. I worked non-stop until it was done. out at the wrinkling and the crookedness. This has the stage lights on it. me that lion is "floating." Now I needed to even the edges and put on the binding. I had 24 hours left before I needed to be hanging it up at the church. I started the binding and finished one and did the next the following morning. It is the sloppiest binding I have ever done. Since I plan to bring these home and quilt them, I the binding wasn't a huge deal. It was supposed to be pinned onto black background. Unfortunately, we had to make some changes. Our background couldn't be extended far enough and we split them up. One on a wall and the other was not in the center of the stage. They turned out to be 44 inches by 34 inches with the binding. This was a satisfying project. I don't really want to call it a quilt because it isn't quilted. I'm going to call it a banner. It may become a quilted wall hanging or even part of a quilt. IMPRESSIVE! So I guess I guessed wrong!!!! : ) How amazing the things we can use our sewing talent for! I bet that banner looked amazing at the woman's conference. What was the theme? Being as bold as a lion? Thank you Vanessa. I wouldn't say you were wrong. It may be turned to a quilt. But I didn't use good quality fabric, so I think a wall quilt would be best. The conference was Wild Women Weekend. Our speaker was Debbie Alsdorf based on her book A Different Kind of Wild: Is Your Faith Too Tame? She spoke at our retreat and can really communicate to women. She had us all in tears! I didn't get any clear pictures of the room. I really wanted to, but we were filled up before I realized my only one was blurry. That sounds awesome, Annette! I never want my faith to be too tame, and God always seems to help me stretch it in some way--like sewing all of my clothes for this year!! Thanks Vicki. I am overjoyed and almost speechless...I've been shouting for joy so I lost my voice! Thanks. Middle Son turns 13 today. He was really attempting to bug me, which is out of character for him until lately. He did wait until people were looking at it and admiring it. This is very nice; you did a great job. Thanks, Meriel. Mr. Toad drew the tree. He is good at those detailed drawings. Mine looked like a bowl of spaghetti with clouds on top. I'm good at tracing and sometimes cutting. Thanks Deanna. I am trying to decide if I'm going to quilt it and hang it in our enclosed stair well to absorb the sound of running boys. It would be like looking at a perpetual sunrise (sunrise because I am imagining looking at it in the morning when I come downstairs to get the house going). So at first glance I thought this was a panel of fabric - that's how good it looks! Awesome job! Thanks Stephanie. Hopefully, this gets turned into a hanging wall quilt for one or more of my kids. I wish that I had used better quality fabric so that it could have been used as a bed quilt. That is so awesome!!! It really does look like a panel of fabric. Thanks Shawnta. Up close you can see the applique stitching, which I actually like.